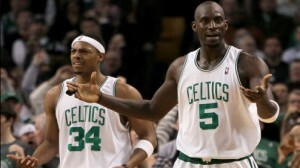 The Boston Celtics (50-32) were first in the Atlantic Division and fourth in the Eastern Conference last season. In 2009-2010, this team proved to be an enigma. They had a great start, looking like World Champions, and then barely made it through the final 54 games of the season. Then they somehow managed to beat some dynamic teams to win the Eastern Conference and go to the NBA Finals. They did lose in the finals to the Los Angeles Lakers. The frontcourt features age at center. There are four centers on the team but number one is 14-year vet Jermaine O’Neal (.529 FG%, .000 3PT%, .720 FT%, 6.9 RPG, 1.3 APG, 13.6 PPG) and number two is 18-year man Shaquille O’Neal (.581 FG%, .000 3PT%, .496 FT%, 6.7 RPG, 1.5 APG, 12.0 PPG). Both have lost some of their edge and neither is expected to play in all 82 regular season games. But both O’Neals can still play and make major contributions. The power spot is manned by Kevin Garnett (.521 FG%, .200 3PT%, .837 FT%, 7/3 RPG, 2.7 APG, 14.3 PPG). Garnett, who came to Boston three years ago, bringing the Celtics their first title in years, has seen his production, minutes and health decline. But he’s still highly competitive and capable of putting in a full 82-game season. Off the bench, power forward Glen Davis (.437 FG%, .000 3PT%, .696 FT%, 3.8 RPG, 0.6 APG, 6.3 PPG) has been an important contributor. The team drafted the talented Luke Harangody this season. He could play this year. Paul Pierce (.472 FG%, .414 3PT%, .852 FT%, 4.4 RPG, 3.1 APG, 18.3 PPG), like the rest of the frontcourt starters, has been showing his age. Pierce, who is in his 13th pro season and all as a Celtic, plays with passion and smarts. He’s a fine shooter from anywhere on the court. That young starter on the team is 24-year-old point guard Rajon Rondo (.508 FG%, .213 3PT%, .621 FT%, 4.4 RPG, 9.8 APG, 13.7 PPG). Rondo, a four-year vet, matured quickly in his first season and is a fine play maker, dishing off valuable assists at a fast rate. He can drive to the basket and hit from mid-range but lacks three-point skills. Rondo is also a very valuable defender. Point man Delonte West (.445 FG%, .325 3PT%, .810 FT%, 2.8 RPG, 3.3 APG, 8.8 PPG), who started with the Celtics six years ago, is back. West has had a tough time staying healthy and keeping his head on straight. He has never played a full season. If he can stay on the court, he could be a major contributor off the bench. Shooting guard Ray Allen (.477 FG%, .363 2PT%, .913 FT%, 3.2 RPG, 2.6 APG, 16.3 PPG) is the fourth starter on Boston to have 12 or more years NBA experience. Like the other vets, his output is in decline. But he’s still an excellent offensive force and for the last two seasons he’s averaged 79.5 games per year. The offense was good last season, earning a rating of 105.4. And although the Pace factor came in at 93.8 (27th), the Celtics converted on 52.2% of their two-point shots. That was best in the NBA. Kevin Garnett had the highest PER on the team (19.51). The Celtics are known for their defense, which last season was one of the best at 93.8. They were second in the league in forcing turnovers, thriving in that area at 16.6%. Defensive guru Tom Thibodeau is gone, taking over the head coaching duties for the Bulls. Despite that loss, there are the two O’Neals, some new young guys and a bunch of returning vets who should get the job down. Some people love head coach Doc Rivers (451-380) and other revile him. Rivers, who previously coached the Magic, is in his 12th year as a NBA coach and his sixth with the Celtics. In the past three, he’s taken the team to the finals twice and won one title. This is a good team that should once again win the division and come in somewhere around third in the conference. The big concern is age as this team of older veterans offers various talented players who can break down at any time. Still, the Celtics are in the weakest division in the league and that certainly helps their chances of taking the Atlantic and getting deep into the postseason once again. Besides offering season previews and predictions for the games, Maddux Sports offers NBA predictions against the spread on the daily basketball schedule. We are locked and loaded for another wallet stuffing season and will beat the pro basketball odds more often than not in 2010-11. 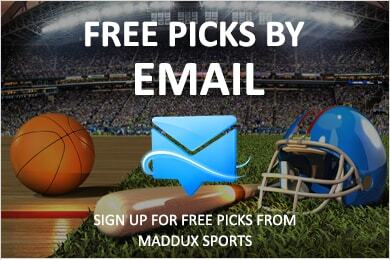 Dont miss one of our NBA picks and sign up today!